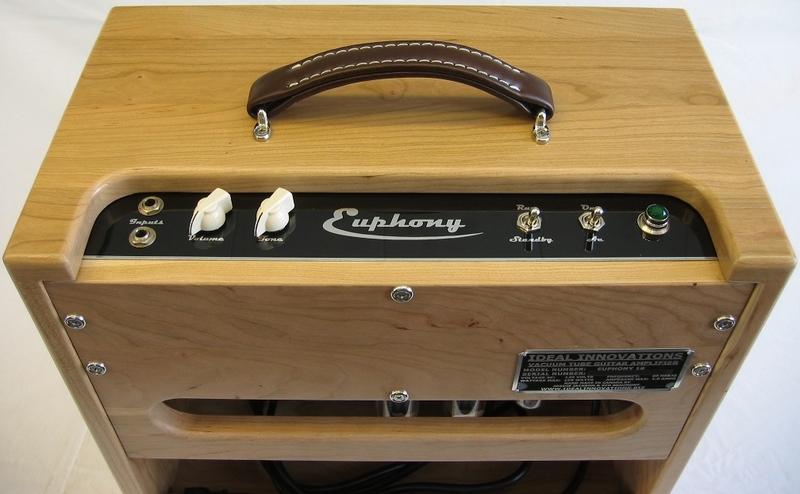 OK. You're wondering what is a "Boutique Guitar Amp"? Click on it - I can't describe it any better! 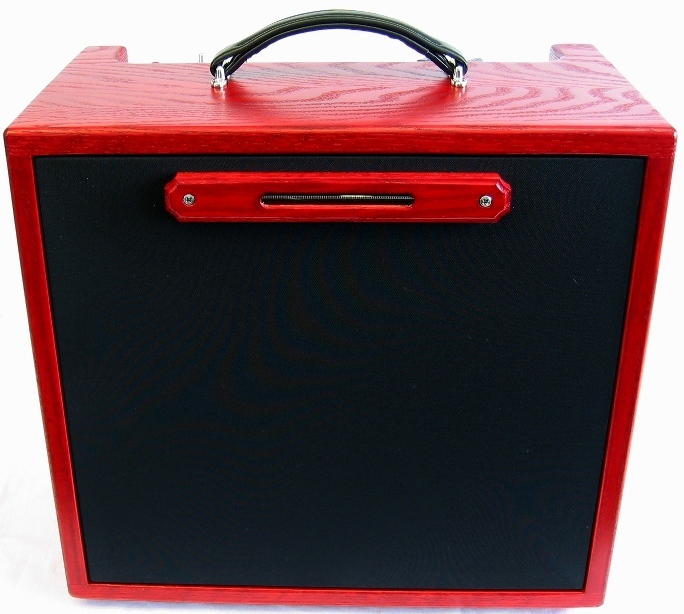 This amplifier is not a toy - it's for the Professional Musician that needs an amp to fit the bill for a long time! These amps are also an ideal choice for home musicians who would like something a cut above the rest. 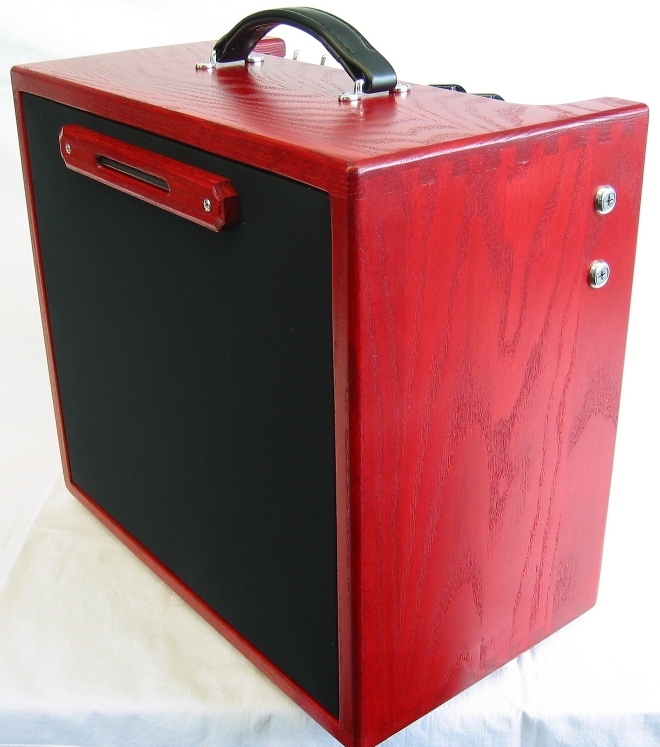 We've built an affordable "Extreme Quality" guitar amplifier for the Passionate Player who's looking for that unique tube sound. 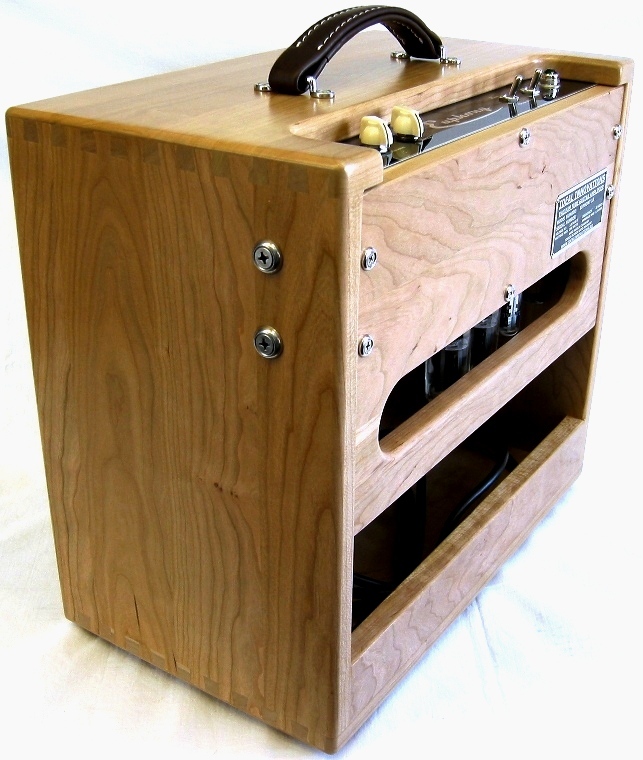 We see a lot of guitar amplifiers come through our repair shop and none - I mean NONE of these are built anywhere close to as well as these Euphony amps. There are many new amplifiers currently offered for much more money and and in our opinion many of these that we have seen are not built well at all - having either serious issues with electronics or cabinetry and sometimes both! 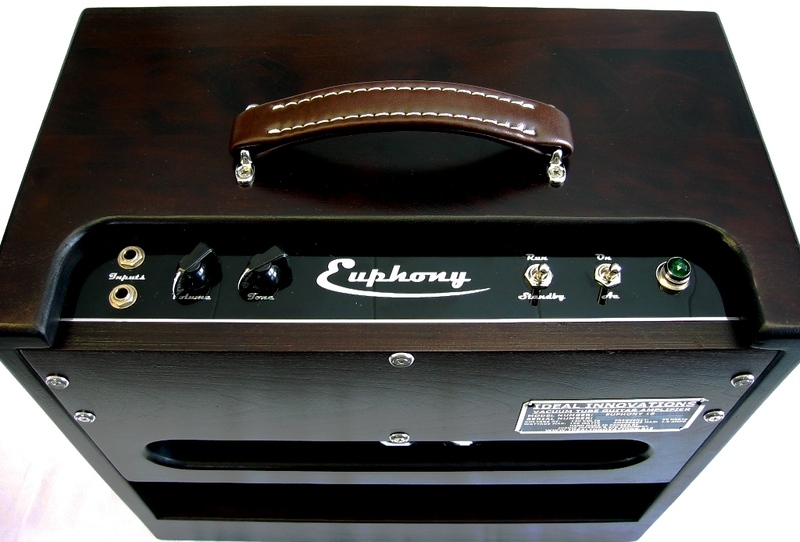 We have actually built these new Euphony18 amplifiers to be the last amp you may have to buy!! These amps come with many years of professional playing experience behind the co-designer of this model, and as you would expect coming from us, they're built to endure!! These amplifiers are priced as indicated below. Please contact us with your questions or more detailed photos. Check out Fred Lewis's Review! We have demo units in the studio if you're fortunate enough to be within driving distance to give one a try. 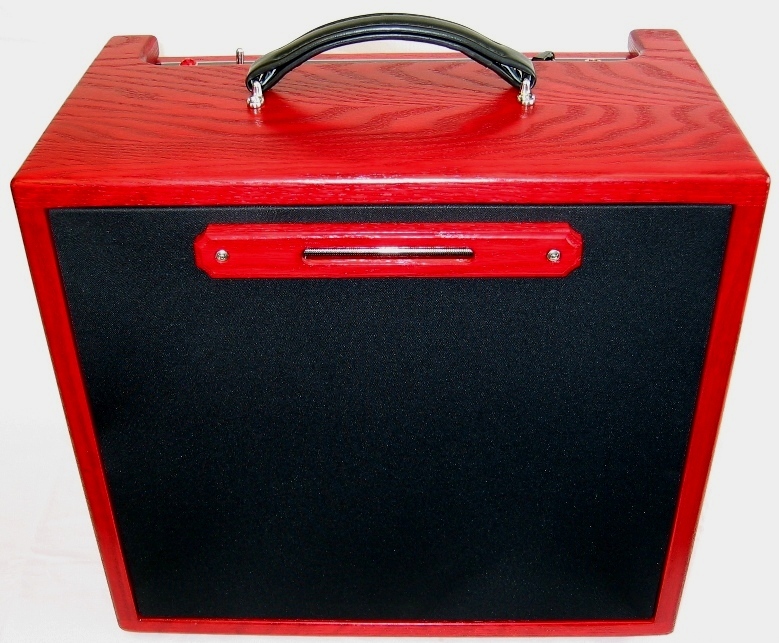 Also don't forget, we are a Custom Shop which means we can provide nearly any options you like including speakers, tube choices, heavy duty slip covers, cabinet hardwood types, and stain & paint finishes. 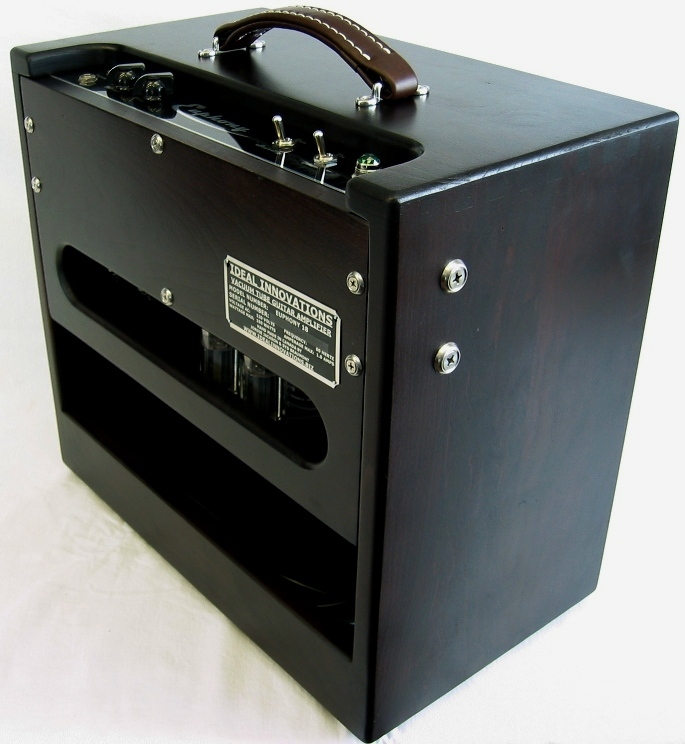 As you can see here our new guitar amplifiers are built to the same very high standards we adhere to with our Hi-Fi tube amps - in short - they're built to last a life time - and the LIFETIME warranty proves it!! Vacuum Tubes - Two Sovtek 6L6's with automatic biasing - no adjustments needed, two 12AX7's - the first one with ultra clean DC powered filaments. 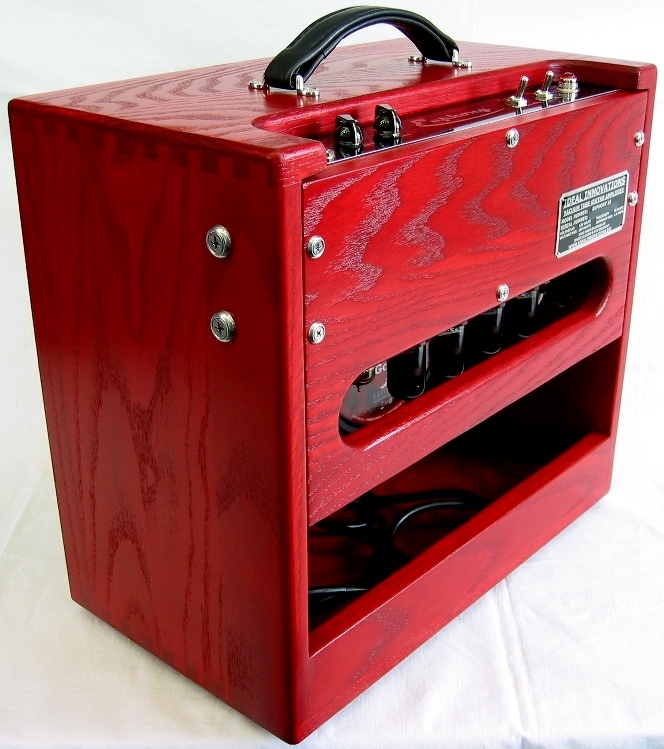 Controls - AC Power Switch, Standby Switch, Volume Control, and a unique Active Tone Control with both Bass and Treble cut. Connectors – Power: IEC320 Inlet, Hi and Lo gain 1/4" Input Jacks and one 1/4" output jack. A 9 foot detachable IEC power cord is included. Circuit Protection – There are 3 internal circuit protection devices to ensure safe operation. Documentation – This amplifier comes with a comprehensive owner’s manual. 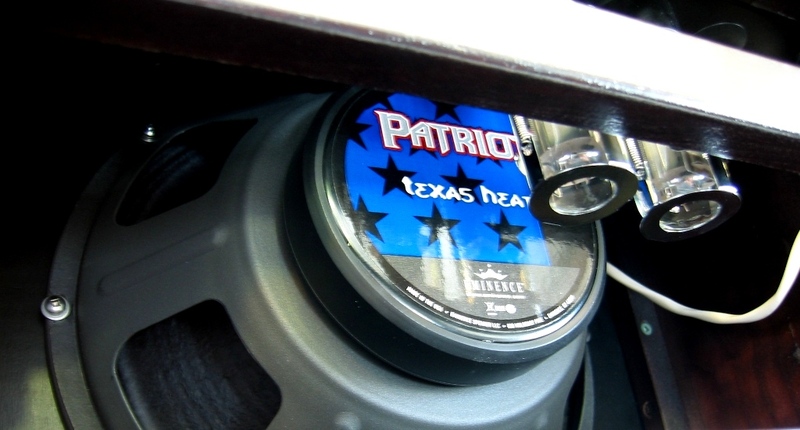 Power Output – 18 Watts RMS - 9 watts with the optional half power switch. Output Impedance – 8 Ohms standard - 4 & 16 ohms are optional.  AC Power Requirements - 120 Volts 60Hz. Power Consumption – 75 Watts. Dimensions – 18”(455mm)Wide x10”(255mm)Deep x 16”(405mm)High and weighs 45 Lbs (21KG). This weight will vary depending on the speaker used. Cabinet - Meticulously hand crafted from top grade kiln dried hardwoods by our woodworking GURU who builds everything as if it's his own! 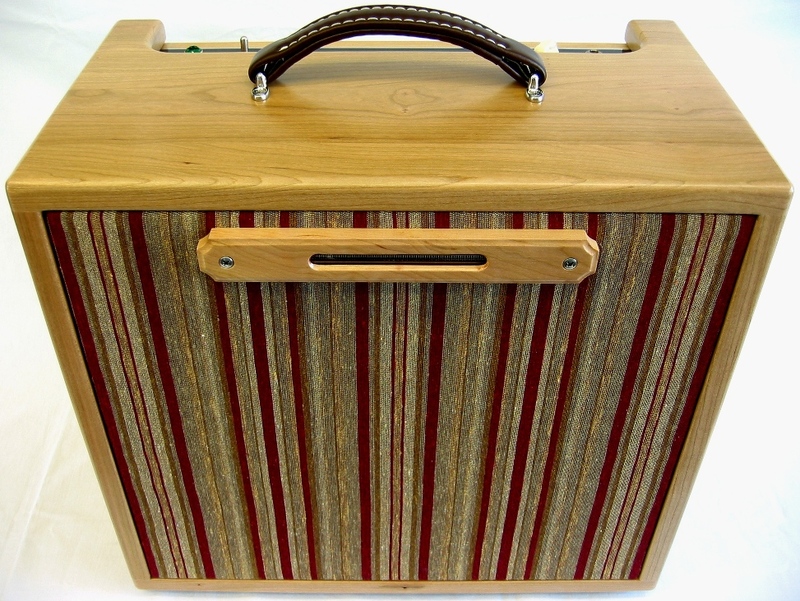 The Baltic Birch cabinets are made from high density 13 ply Birch hardwood. All corners use precision fitted Dove Tail joints - known to be the strongest wood joint possible. 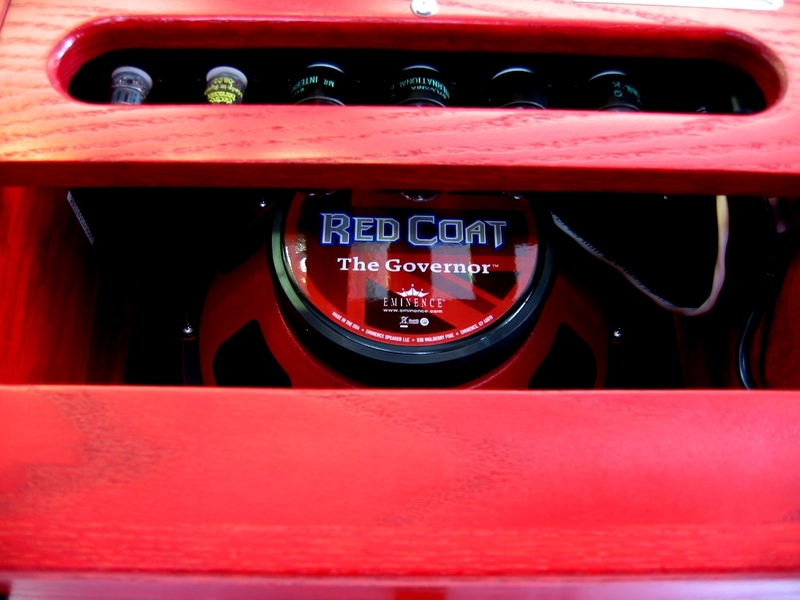 Hardware – All of the hardware fasteners used on the exterior of these cabinets, including the T-nuts & screws that mount the speaker, are stainless steel. The rear cover is held in place with machine screws going into PEM nuts which won't wear out like screws going into wood. Transformers – High quality Canadian made power and output transformers which meet Ideal Innovation's exact specification. Chassis – High precision, custom made, heavy gauge steel, finished in black textured powder coat for maximum durability. PEM nuts are used exclusively for all fasteners. Other – Resistors are all ceramic or metal film flameproof and rated at 1 watt or more regardless of actual load. Signal capacitors are all high quality ORANGE DROPS for long life and excellent performance. Power supply caps are all rated at 105 degrees C. All potentiometers are full size – not those little cheapies that wear out after a while. All tube sockets are ceramic with good quality pin contacts. Input jacks are Switchcraft - they just last a long time! Slip Covers - A Heavy Duty protective cover made from a very heavy weight, padded, cloth lined black vinyl material will be included at no additional cost for a limited time only. 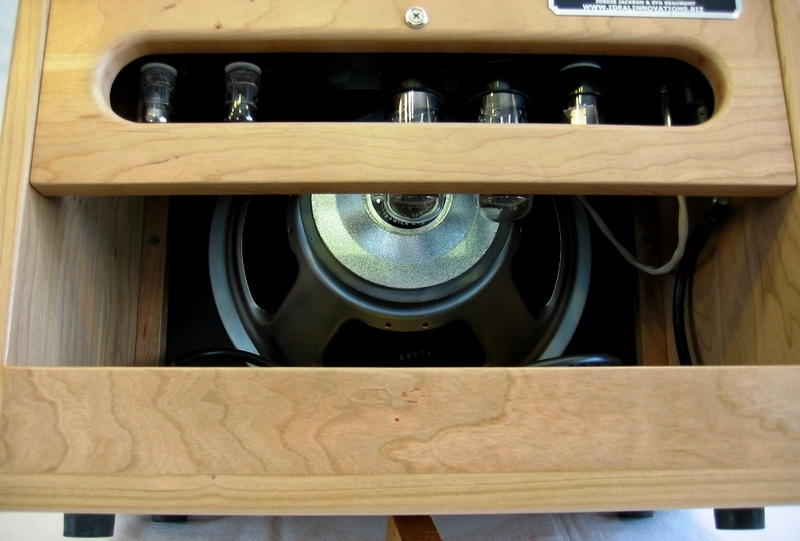 Speakers - We commonly use Eminence, Jensen, Celestion, Weber and can provide nearly any other speaker made. Shipping costs are normally $215.00 to most Canadian destinations. We normally ship once per week and prefer to use Canada Post and always include insurance for your protection. All Canadian customers will have to pay GST and in Ontario 13% HST. 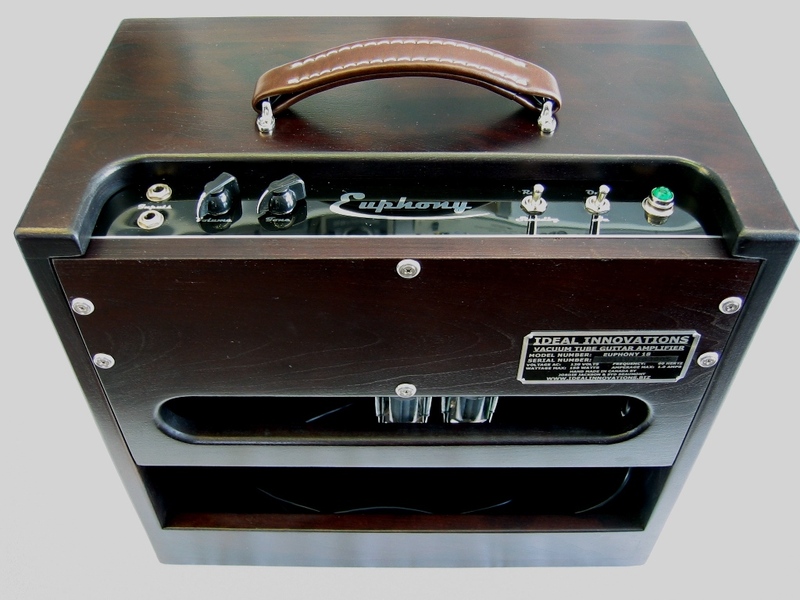 Warranty - The Euphony18 amplifier comes with a LIFETIME warranty on everything but tubes which are 90 days. This warranty is subject to the terms and conditions of our Warranty policy as posted on our website. Returns – A full description of our return policy is posted on our website. 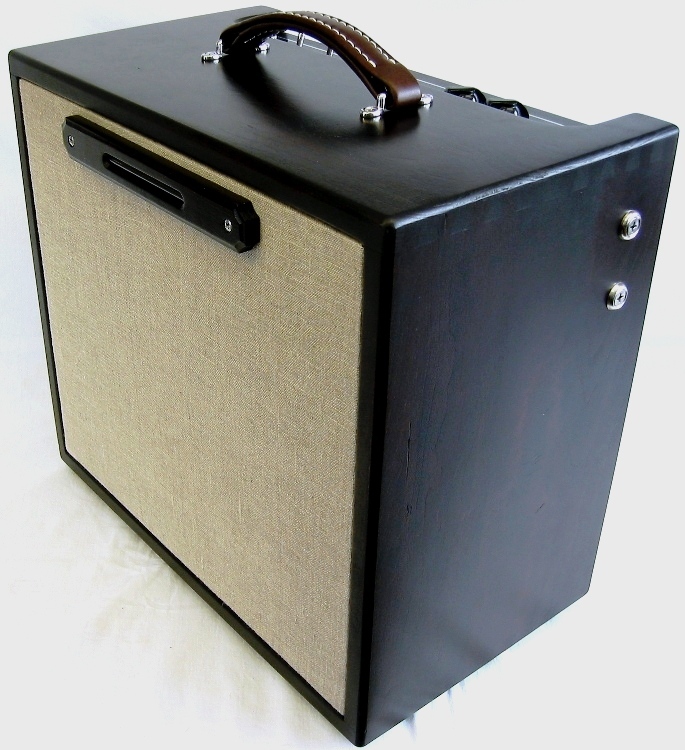 This is now your chance to have a "One Off" "Custom Boutique" amp affordably built to your specs! 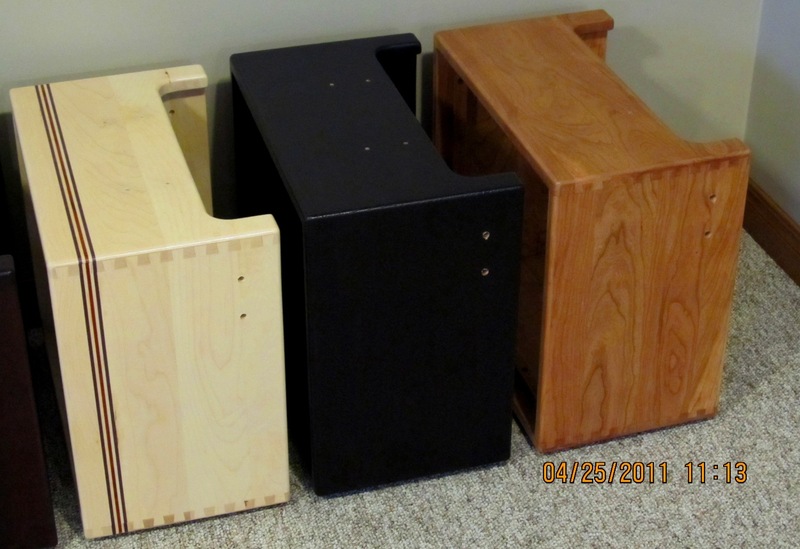 Here are the new cabinets we currently have in stock. What you see here is what we have so don't wait too long to decide which cabinet is for you. Let us know which one you like and we'll send you some hi-res photos. 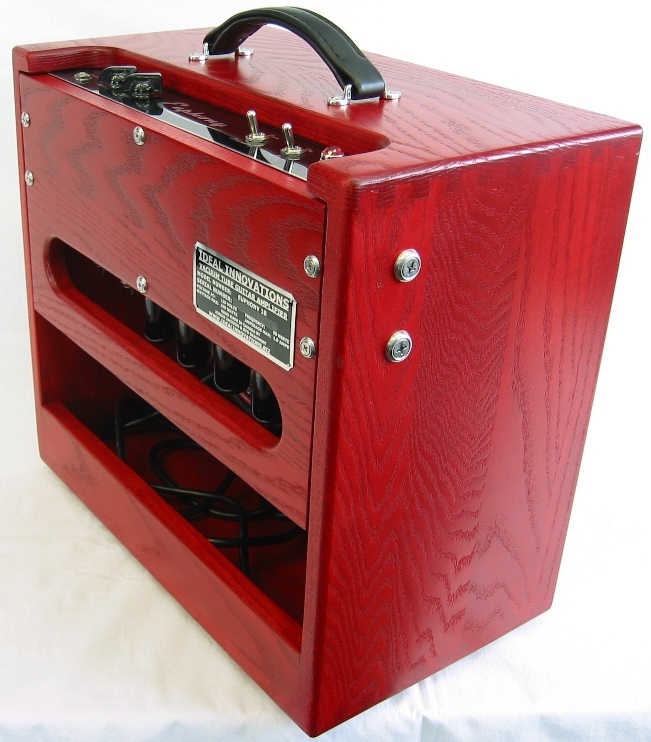 The price of the hardwood amps starts at $2799.00 - this may vary due to options. 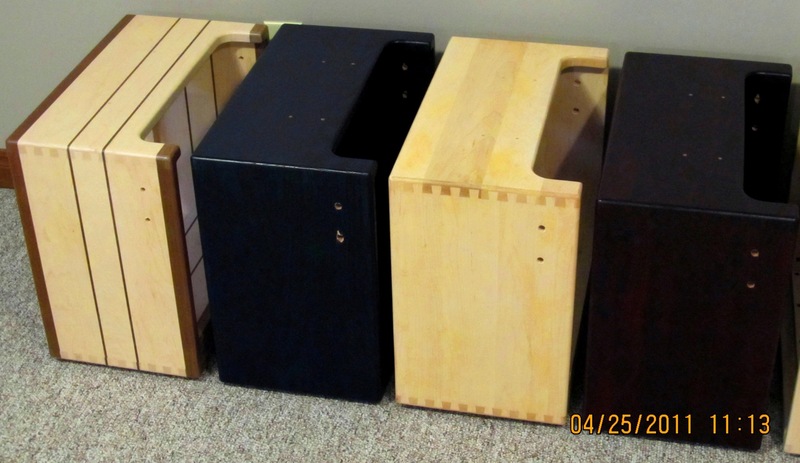 These painted Baltic Birch amp cabinets can be built starting at $2599.00. Visual Indicator Tube - TOO COOL!! 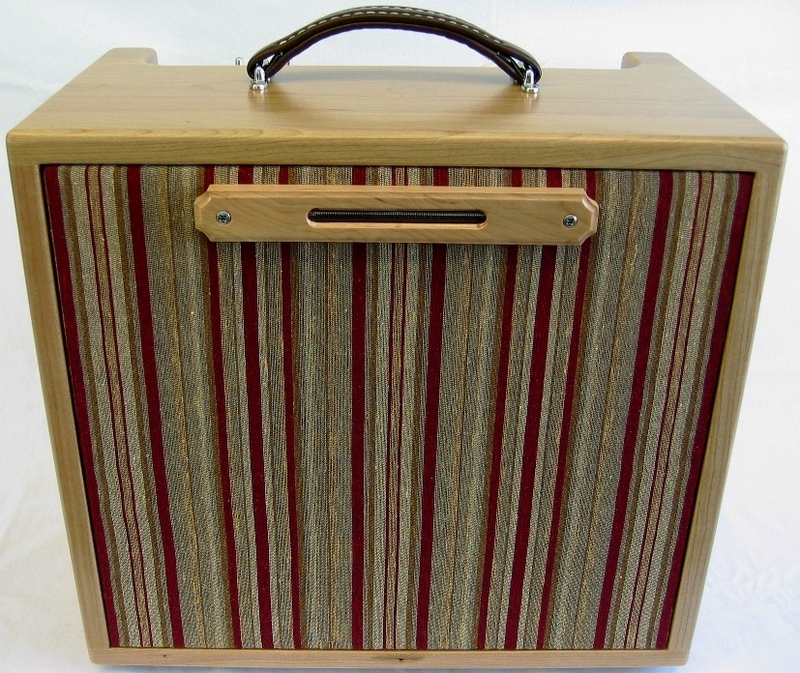 Here is the "Natural Cherry"
with the cool Retro grill cloth. 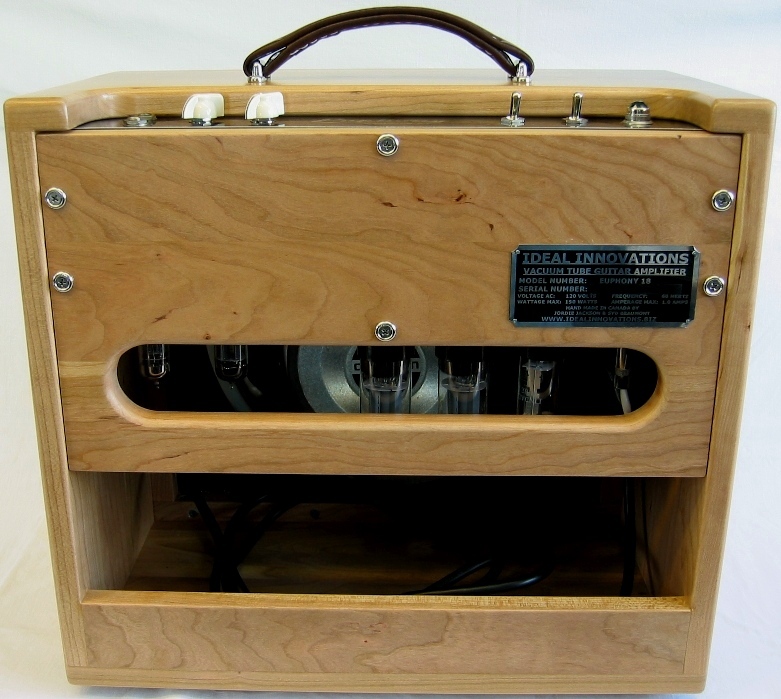 This amp also features a tube rectifier! 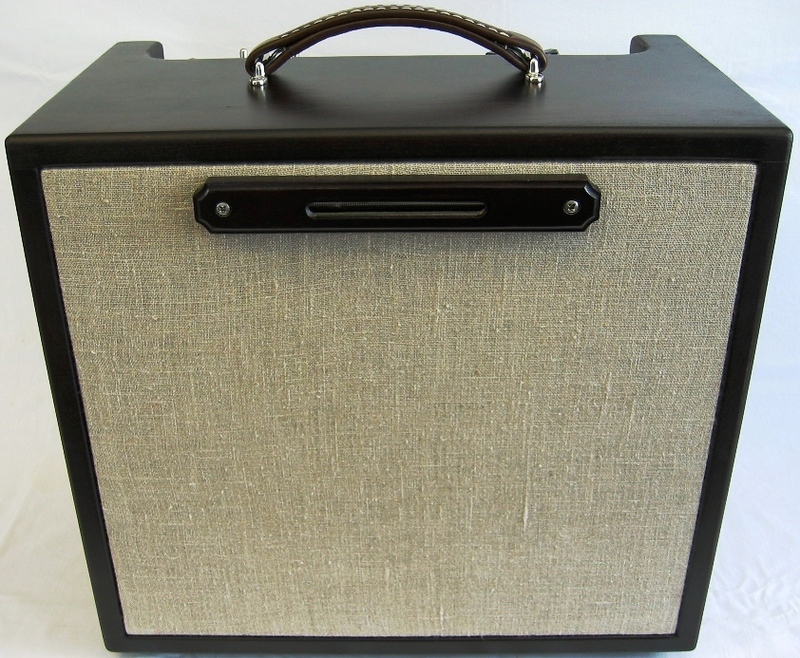 This amp is now being offered as a used Demo unit but we are are backing it with a full as-new warranty. It has been handled and played a lot so it does have some minor road wear and this is why we reduced the price. 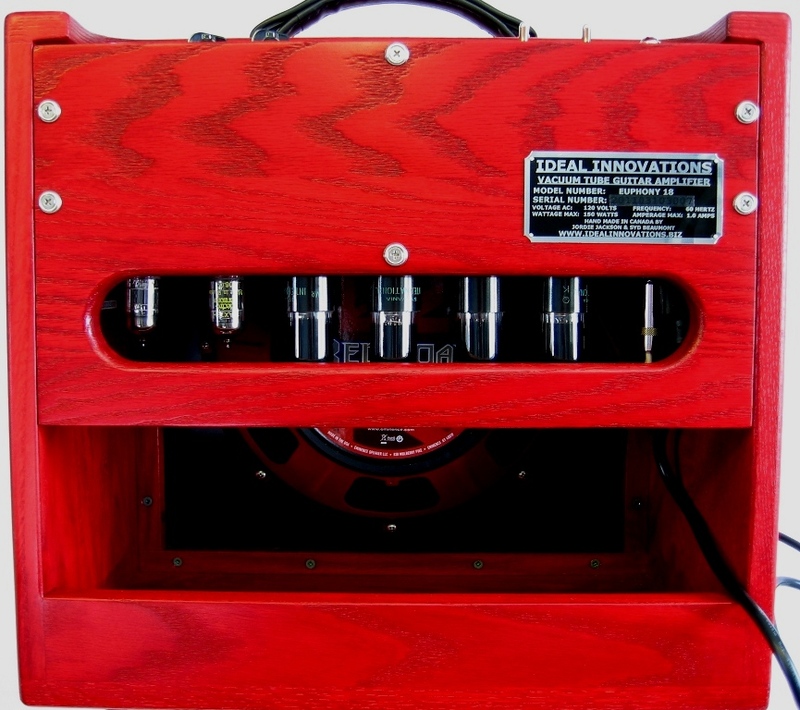 The Piner features a classic design using cathode biased (automatic bias no adjustments required) 6L6's for output tubes providing 18 watts RMS output power. A couple of 12ax7's provide the cool front end tone and ample drive for that desired breakup when you want push it! All this drives the ultimate tone maker - the 12" JENSEN C12R. 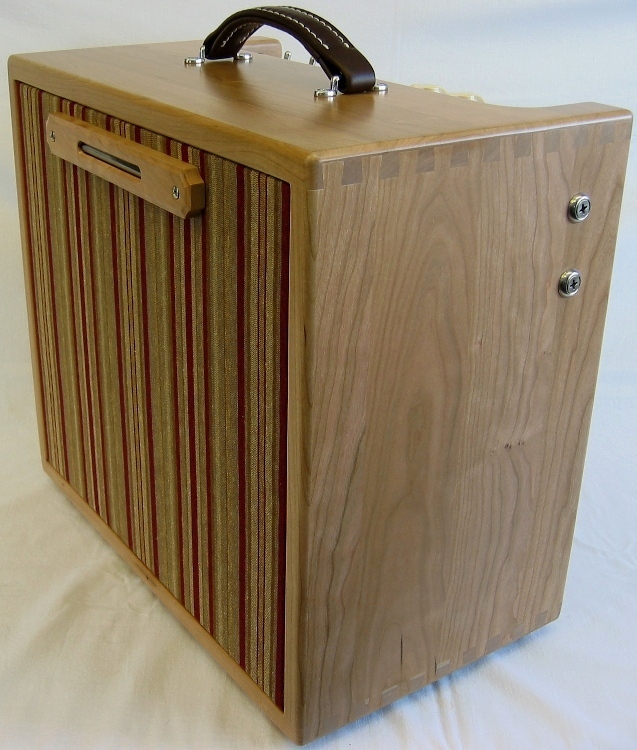 The cabinetry workmanship is nothing short of excellence with these amps. Dovetail corner joints provide an ultra rigid enclosure that will stand up well for decades. The cabinet's solid resonance delivers to the max on tone. for additional details & purchase info on these items.